Gammaproteobacteria is a class of several medically, ecologically and scientifically important groups of bacteria, such as the Enterobacteriaceae ( Escherichia coli ), Vibrionaceae and Pseudomonadaceae. Like all Proteobacteria, the Gammaproteobacteria are Gram-negative. 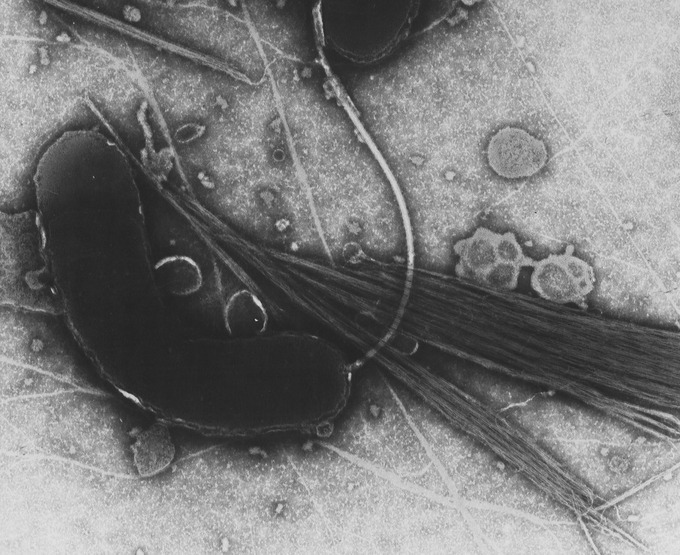 Gammaproteobacteria: Transmission electron microsope image of Vibrio choleraethat has been negatively stained. Vibrio choleraeis the bacteria responsible for the gastroinestinal disease cholera. In order to get the disease cholera, the bacteria must be able to colonize in the small intestine and a critical factor necessary for this colonization is the toxin-co-regulated pilus(TCP). 0395 is a wild type strain, showing the normal bundling of toxin-co-regulated pilus(TCP). Wild-type pili are clearly visible as 7 nm fibres that form bundles @ 0.2Ð0.3 µm wide and 3Ð6 µm long. The Gammaproteobacteria comprise several medically and scientifically important groups of bacteria, such as the Enterobacteriaceae, Vibrionaceae and Pseudomonadaceae. A number of important pathogens belongs to this class, e.g. Salmonella spp. (enteritis and typhoid fever), Yersinia pestis (plague), Vibrio cholerae (cholera), Pseudomonas aeruginosa (lung infections in hospitalized or cystic fibrosis patients), and Escherichia coli (food poisoning). The Enterobacteriaceae is a large family of Gram-negative bacteria that includes, along with many harmless symbionts, many of the more familiar pathogens, such as Salmonella, Escherichia coli, Yersinia pestis, Klebsiella and Shigella. Other disease-causing bacteria in this family include Proteus, Enterobacter, Serratia, and Citrobacter. This family is the only representative in the order Enterobacteriales of the class Gammaproteobacteria in the phylum Proteobacteria. Phylogenetically, in the Enterobacteriales, several peptidoglycan-less insect endosymbionts form a sister clade to the Enterobacteriaceae, but since they are not validly described, this group is not officially a taxon; examples of these species are Sodalis, Buchnera, Wigglesworthia, Baumannia and Blochmannia. Members of the Enterobacteriaceae can be trivially referred to as enterobacteria, as several members live in the intestines of animals. In fact, the etymology of the family is enterobacterium with the suffix to designate a family (aceae) — not after the genus Enterobacter (which would be “Enterobacteraceae”)— and the type genus is Escherichia. Members of Chromatium are photosynthetic and oxidize hydrogen sulfide instead of water, producing sulfur as excrement. Some Gammaproteobacteria are methane oxidizers, and many of them are in symbiosis with geothermic ocean vent dwelling animals. Gammaproteobacteria include an exceeding number of important pathogens, e.g. Salmonella, Yersinia, Vibrio, Pseudomonas aeruginosa. Like all Proteobacteria, the Gammaproteobacteria are Gram-negative. Some Gammaproteobacteria are methane oxidizers, and many of them are in symbiosis with geothermic ocean vent dwelling animals. symbiosis: A close, prolonged association between two or more organisms of different species, regardless of benefit to the members. pathogens: A pathogen or infectious agent (colloquially known as a germ) is a microorganism (in the widest sense, such as a virus, bacterium, prion, or fungus) that causes disease in its host. The host may be an animal (including humans), a plant, or even another microorganism. Gammaproteobacteria: Gammaproteobacteria is a class of several medically, ecologically and scientifically important groups of bacteria, such as the Enterobacteriaceae (Escherichia coli), Vibrionaceae and Pseudomonadaceae. Like all Proteobacteria, the Gammaproteobacteria are Gram-negative.